Great to see our beloved game making an appearance in popular culture. Not bad for a game that’s been around for 1500 years still exciting the masses after so much time. Good also to see knights developed before bishops too, as it should be! Well done team! A fine effort to beat a strong Beckenham team 10.5-5.5 in the final. Wednesday 12th September 2018 sees the start of junior club for the new season. For full details and how to join please see our dedicated page. 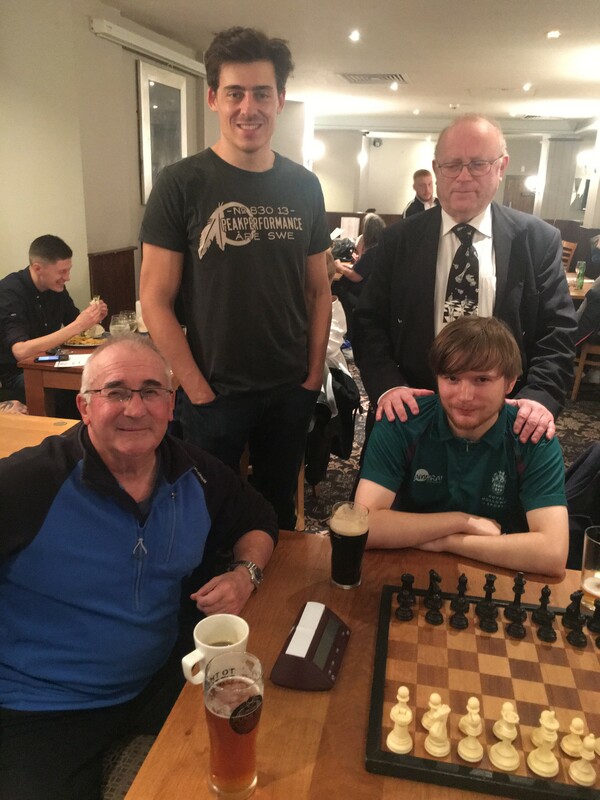 In addition to our regular fun competitions, variants, prizes and entry into the Delancy chess challenge (the biggest chess tournament in the world), we will be entering a team in the Kent league (Intro Cup) where we will be inviting our more accomplished juniors to play for the club and town. Joining the English Chess Federation, in turn, and embarking on their journey to titles and greatness! We are running two classes this term and next so we have plenty of space for new members. Another year has gone by and in that time we have lost three former members of the club. Nigel Harvey until recently had been member since the 80s died in December. He had had a long battle with cancer for over 10 years, a battle he sadly lost in December. John Driver who until recently had been a member for over 10 years was enjoying a rare visit to the club, died suddenly at the board. Roy Harper, a member of the club for a few years, died in March. I would like to express my condolences to all the families on behalf of the chess club. I’ve said this before and will say it again: it is my view that nobody should get too comfortable in the roles they perform for the club. I have now completed three years as chairman. Only the membership can judge as to whether they were three years good or bad years. It is time for somebody else to take up the role of chairman. This is not to say I am not unwilling to continue in the role, I would just not oppose anybody who wishes to have a go. It has been extremely busy year for me in relation to the club. In December the vegetation growing at the back at the club came down during a storm into the clubs back courtyard. Also with the death of Nigel Hartley there was a lot of work to get the flat back up to a level where it could be rehired. This work which was done over a period a 2 ½ months costs the club approximately £2000 and lost the club approximately £1200 in lost rent, something I’m sure Jim Wheeler will report on. I would like to thank Paul Kelly for work he did in getting rid of the vegetation at the back of the flat and welcome him as the new tenant. Another major issue which came to light when dealing with the flat was the fact that we seemed to be paying over the odds for our water, paying two lots of standing charges, road drainage, and waste water. This seems ridiculous to me so I took on the water companies and after six months of arguing with them the water company eventually saw things my way but not before giving £220 in goodwill gestures. I’m happy to report the we are now on a water meter which means instead of playing in advance we now paying in arrears and we are only playing for what we use, a potential saving of about £1000 a year. Another issue that came to light and is something we will need to address in the next five or six years at considerable cost is the upstairs conservatory which is in a dreadful state. This again will have a cost implication on our budget. I was hoping this year to ring fence £1500 a year over the next five years in order to get this work done. However, because of the previous mentioned issues with the flat this year, it had to go by the board. We’d intend to start this process this year. In what now seems to be becoming a tradition Alan Barton gave a talk at the club in June and July. I’m sure all those that attended enjoyed these talks. I would like to thank Alan for his efforts. Paul Buswell did one of his traditional bank holiday tournaments which was greatly enjoyed by all. It was very nice to see Paul in the club and would like to thank him running this tournament. We also ran three Weekender tournaments this year bringing in a small profit. However I’m unable to continue to do these as I’m now employed at weekends. Anyone wishing to take over these tournaments please let me know. We have a twinning events on the 23rd and 24th of September when Bethune visits us. I’m very grateful for the fact that Mason Woodhams very kindly agreed to run this. Any members wishing to offer their support please contact Mason. The internal tournaments seem to be running on a reasonably good timetable now and all the winter tournaments have been sent for grading. My thanks to Raza for looking after these. Congratulations to Ollie Willson in the coming club champion in convincing style with no losses and drawing only three game. Mason Woodlands was a likely winner of the Pelton. Roy Webb and Anna Pontonutti sharing the Rush. We failed to qualify for the semi-finals in the Harvey En Passant and Fuller in the Stevenson and went out in the semi-finals. Roy Bourne, despite health issues, continues to function as a housekeeper although there have been a few problems with the opening of the club. It is still preferable to having no one at all in the building to open I thank him for his efforts in the past year. Please remember that the AGM is your opportunity to express your views on how the club is run. At the last AGM everything seemed to go through on the nod which of course makes my life as chairman very easy. However I would rather have a lively AGM in which things are discussed in order to facilitate the best outcome for the club. Lastly, I’d like to thank all the members of the committee for their work during the last year. Items in the pipeline include repairs to some damage to the upper gable, the gents toilets are in need of refurbishing as there is a leak to the lower ladies toilet ceiling but it’s not clear where the leak is coming from, I am looking to get some quotes for the toilets, lots of the firms I use at work are not interested in “domestic” work they deal with large “commercial” works so it’s quite hard just to get someone to turn up when I want them let alone quote, the area above the gents toilet is in need of the glass roof repair which could be the cause of the leak when it rains but this will be an expensive item. The new sign needs to be put up. The small water heater in the kitchen area needs replacing. I am pleased to report that the club library has again been the beneficiary of some significant donations. Some are from the estate of the late Nigel Harvey, while pride of place must be taken by four substantial hardbacks from a US publishing firm which the ECF office has donated via the agency of James Wheeler. The four books are on Capablanca, Joseph Blackburne, Henry Bird and our own Vera Menchik. In addition, former mayor Paul Smith, on a recent trip to Prague, secured a copy of the 2016 Czech book on Vera Menchik on behalf of the club. This is in the difficult Czech language, of course, but it is richly illustrated. If necessary I can decipher sample sentences in the work, should any member wish to avail himself of this service.